Everyone is talking about DNA Painter, a tool that helps you find connections between your DNA matches. I finally decided to see what it was all about. I believe I am addicted. How do you use this nifty utility? You enter your match’s chromosome data into into the “painter” and it “paints” the sequence. The more sequences you paint, the more connections you find. DNA Painter works with all the genetic testing websites that have chromosome browsers. This includes FTDNA, 23andMe, and MyHeritage DNA. It does not work with AncestryDNA. 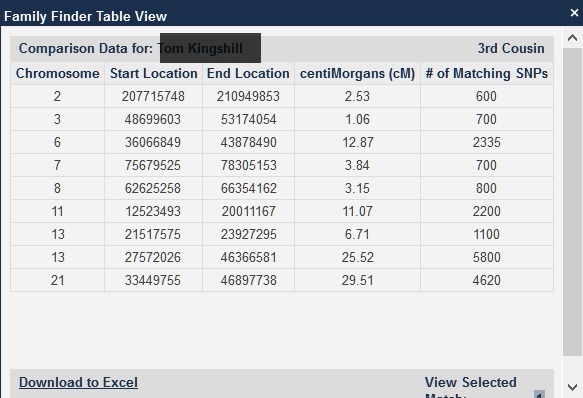 It also works with GEDMatch.com. Adding information to this utility is as easy, but tedious. There’s no option to update raw DNA files. You must copy and paste the chromosome data of each match one by one. Easier said than done. After working on this for 2 weeks, I have painted 394 segments. I’m on page 7 of 32 in FTDNA. Zoinks! Some sites are easier that others. I’ve tried with FTDNA, MyHeritage DNA, and GEDMatch. I found FTDNA to be the easiest to copy and paste from. How Does Chromosome Painting Help You? This utility is especially helpful when you have matches at multiple websites. You could take notes on where you match people or type them into a spreadsheet, but it’s difficult to sort in an easy to read fashion. Take a look at this example for my maternal matches on chromosome 2. If I were to enter this into a spreadsheet it would be difficult to make sense of. But, looking at this graphic makes it so much easier to understand. I have a whole heck of a lot of my maternal matches who share the same segment range on chromosome 2. And, I’m not done yet! Chromosome painting allows you to add in all these different matches and see where exactly on a chromosome they match you. The more people you add, the more similarities you find. From there, you compare pedigrees and find your common ancestors. This is how I approached this project. I started by adding the 10 people I know my relationship to. For each, I created a category based on the ancestor they are related to. Once this was done, I added my highest matches. As I added people, I could see patterns emerge. This is the data that you copy and paste. This example is from FTDNA. I created new groups when the person provided enough information in their family tree to narrow it down. For instance, one woman’s entire tree is from Ireland, so I created a group “Unknown Maternal Irish”. It’s very clear which matches are from my Azorean lines. Some fit in with my matches, but others don’t. You can see how this works. As you learn more information about your matches, you divide segments between categories. As you narrow it down, it will get easier to identify the common link. This example gives you an idea of how this whole chromosome painting thing works. Notice that people who share the same sequence are grouped together. There is a toggle to show names. I’ve turned it off for privacy purposes. This example shows the people who are related to my Botelho da Rocha and Pacheco de Resendes (Pacheco Remigio) line based on the data from my two known cousins who descend from this line. I can’t necessarily assume all these people are related to me through my Botelho da Rocha line. The reason? My known match is related to me more than once. We are also Pacheco de Resendes and de Braga cousins. However, if one of those people turns out to only be a Botelho, Pacheco de Resendes, or de Braga descendant, then I will have figured out how the rest connect. You can see how helpful this could be in sorting matches. It’s easy to read in this format. You can even print out your data if that is easier to work with. As I enter more people, I am seeing patterns emerge. 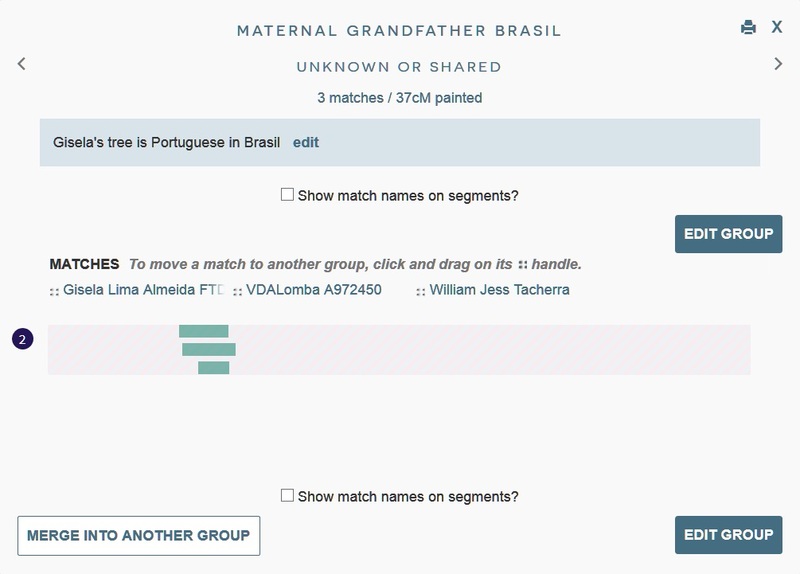 For instance, in this example, I have one match whose entire tree is Portuguese from Brasil. The other two are also Portuguese. As more people match this segment, I may find that they descend from one of my lines that went to Brasil. If you’ve had your DNA tested, you’ve figured out by now that this stuff ain’t easy! Genetic genealogy has it’s challenges. DNA Painter is one more tool in the toolbox to help you analyze your matches. Give it a try! Start with the matches you already know, then work your way through your best matches. Who knows? You might see a pattern you hadn’t noticed before. This is a terrific post! I’ve been slow in moving to doing this despite having a number of family members tests as well as a number of confirmed common ancestor matches in every great grandparent line. But this was very helpful and I’m excited to get started. One question – when you talk about maternal line matches are you getting this from DNA data itself or just the fact that the common ancestor (or shared match with common ancestor) shows that it’s on the maternal side? Bill, Thanks for the compliment on the post! Let me answer your question. When I referred to my maternal line, I referred to chromosome segments that I have already identified due to other known matches. So, I’ve already known how I’m related to these individuals. Then, I used that information in DNA Painter to sort other matches. I have a somewhat easier time dividing between paternal and maternal matches, though not within my maternal line. My paternal line is entirely French from one region of France. It’s a little more tricky on my maternal side. My mom’s father was Portuguese (from the Azores), but her mother’s line was British (twice), Irish, and Welsh. Using DNA Painter, I can take individuals whose family tree is from one country (Ireland, for instance), then match and sort others who share that segment. I can then look at those trees to see if they have Irish. Hope that answers your question! I think it would be very helpful for you as you have multiple family members who have tested. Love the DNA-painter! It is so annoying if you have a good match at MyHeritage and then you can’t compare it with a match at FtDNA. Painter solves that! Linda, I was resisting it for a long time. One more thing to learn. I’m so glad that I gave it a try. It is very frustrating that you can’t compare easily between different companies. Even with the chromosome browsers, it’s challenging to visualize. This makes it so much easier! DNA Painter is my new favorite toy too, Melody! I only save my known matches though. I then compare other matches in the preview screen, to garner hints as to how to identify them. Makes me want to prove new connections even more. Dara, I’m hoping that it will lead to proving connections. I have very few good matches, so I could use all the tips I can get!